If this jam-packed motorcycle museum doesn’t make you smile, see a doctor! Nigel Stennett-Cox visits a motorcycle museum whose exhibits are crammed into old railway buildings in North Norfolk. If you appreciate the quirky and different, you’ll love a visit to the Norfolk Motorcycle Museum, for I cannot conceive of another such establishment being quite like it – certainly nowhere else than such a remote and rural location as the small market town of North Walsham in beautiful North Norfolk. Maybe the nearest equivalent would be Murray’s in the Isle of Man, another family-run establishment. 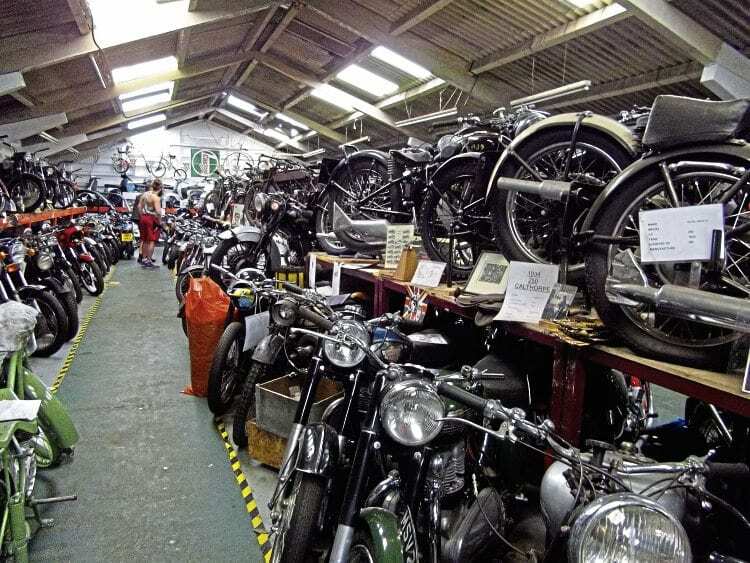 To say there were plenty of bikes to look at in the Norfolk Motorcycle Museum would be something of an understatement. This is the view from ‘alley number one’. Octogenarian George Harmer and his son Steve founded the museum in 1994, at the same time to within a month as your scribe moved east, so it’s been good to see the venture gradually become established over that quarter-century. There are also volunteer helpers, the main ones currently being ex-teacher Andrew Neall and Max Mariner. Starting decades ago, says former RAF man George, he forewent booze and baccy to spend savings on any kind of old motorbike that took his fancy until coincidentally, when storage was becoming a problem, his son Steve became redundant from his work, so the scene was set to acquire some premises. Before Dr Beeching, he of the drastic rural railway cuts, North Walsham hosted two railway stations, and adjacent to the remaining one sit two large buildings, one now crammed with old bikes and parts, with related paraphernalia including the odd three and four-wheeler occupying the other. Next Post:French fancies – and a gorgeous Belgian Lady!